Every day, Watch This offers staff recommendations inspired by a new movie coming out that week. This week: Brian DePalma’s Passion, based on the French thriller Love Crime, has us recalling other American remakes of foreign-language movies. Given the reins of a Seven Samurai remake, John Sturges turned out his own modern Western classic with The Magnificent Seven, a tale that re-imagines Akira Kurosawa’s hired-swordsman masterpiece as a saga of guns-for-hire cowboys employed to defend a poor Mexican farming town from Eli Wallach’s ruthless bandit. Sturges’ direction is subtly evocative throughout, using a variety of low-angled medium shots to accentuate the nobility of his heroes, led by no-nonsense Yul Brynner, and including laid-back Steve McQueen and quietly gallant Charles Bronson and James Coburn. If Sturges’ assured aesthetics—which extend to Elmer Bernstein’s horn-heavy theme music, and evocative panoramas of the dusty Mexican landscape—give The Magnificent Seven an epic aura, so too do its performances. Wallach’s villainy is plain to see in his alternately smirking and snarling face, with the actor establishing his character’s nastiness in the film’s opening frames when he casually washes his face while chatting up the townsfolk he’s come to rob. That evil is contrasted with the stoic integrity of Brynner’s leader, who exudes unflappable self-assurance and toughness. If Sturges’ film has a nagging flaw, it’s that his heroes have none: So fundamentally good are the titular protectors—even Brad Dexter’s money-seeking comrade is, at heart, decent—that the film musters little more than black-and-white conflict. Nevertheless, The Magnificent Seven marries multi-character drama and gunfight thrills to rousing effect, all while respectfully attuning itself to its source material’s way-of-the-samurai codes of honor. 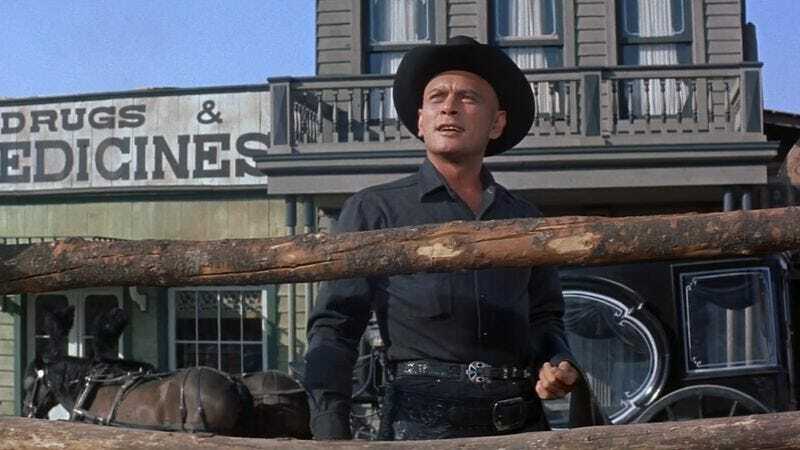 That element is best expressed through Brynner’s belief—evoked early on, when he risks his life to bury a Native American with the rest of his Caucasian scoundrel mates—that a man is defined not by race or class, but by his actions. Availability: The Magnificent Seven is available on DVD and Blu-ray, for rental or purchase from the major digital providers, and through Netflix’s disc-delivery service.